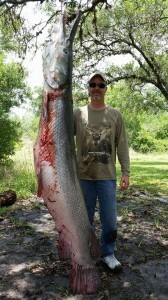 I can offer you some of the best Alligator Gar Bowfishing Texas has to offer. I grew up fishing Alligator Gar alongside Sims Bayou in Houston Texas. I can tell you that once I got my first taste of bowfishing for Alligator Gar there was NO going back for me. I love bowfishing! I know you will feel the same way. I have clients that come back year after year because there is no beating the adrenaline rush you get from bowfishing. If you are looking for an amazing Texas fishing trip or a incredible Texas sightseeing experience, look no further. Skip the boring everyday tours that every city offers. Bowfishing for thee prehistoric Alligator Gar in Texas is a unique experience that you won’t soon forget. I have taken people from all over the world bowfishing. 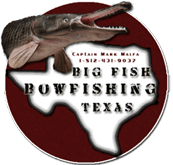 Big Fish Bowfishing can help make your Texas dream bowfishing trip a reality and have the potential of a state trophy record, now that is souvenir not found in a gift shop. I also make sure you get plenty of pictures of your catch. Honestly anyone can bowfish for Alligator Gar, men – women – children. Even if you have never held a bow before you can bowfish! Bowfishing is an excellent way to learn about the sport of archery. I can definitely help you learn how to hold the bow correctly along with safety tips, and give you tips on perfecting your aim. Bowfishing is also an excellent hand eye coordination activity for children as well as a great family activity. I have OVER 35 years of experience in bowfishing for Alligator Gar all over Texas. Because Alligator Gar are my passion and I have traveled all over Texas hunting them; I know all of the best spots in each river and lake to ensure you get yourself a good sized Alligator Gar on your trip. You might have a certain body of water in mind for shooting your Alligator Gar, I am more than happy to take you there. 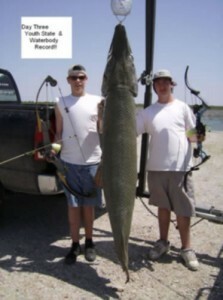 These young men set 2 Alligator Gar records that day. All you need to bring is yourself and your Texas fishing license. Texas fishing licenses can be picked up from just about anywhere and cost $17.00 the first day and only $8.00 for each additional day for out of state residents. You can also purchase it online from the link at the bottom of this page. I have all the bowfishing gear that you will need to catch Alligator Gar. However, if you prefer your own bow setup as many do, you are more than welcome to bring your own. Sun screen, polarized sunglasses and snacks are all also a good idea. I offer multi-day Alligator Gar trophy hunt packages for those interested in capturing the river monster sized Alligator Gars found in Texas. 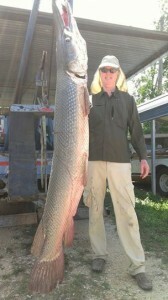 At the end of the trip you will have a trophy sized Alligator Gar for mounting.